Crack the Safe at Lucky Club Casino this month and collect up to $2000 in bonuses every day in June. 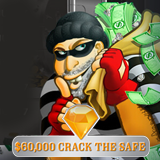 Crack the Safe bonuses include free spins on the Bank Bandit slot game from Nuworks. “Carry out the perfect heist and you can be $2000 richer!” said casino manager Alex Hunter. “Bank Bandit is one of our most popular games – we’re going to have a lot of fun with this one this month!" Until the end of June the metro-style casino is offering a choice of daily bonuses which all include free spins on the Bank Bandit slot. Choice of deposit bonuses that include free spins on Bank Bandit slot from Nuworks available until June 30, 2017. Coupon code for all bonuses: LCJUN17. Wagering requirement: 30X. Free spin play-through: 10X. All bonuses are available once a day until June 30, 2017 only. Max. bonus $2000/day. Bank Bandit is a feature-packed game with hilarious animations. Bungling bank robbers race to get the loot from the safe in the fast-paced game with cartoon graphics and loads of free spins to make the fun last. It’s a 25 pay line slot with animated “Vault” Scatter symbols and “Robber” Wilds that trigger free games that can give massive payouts -- up to 16x the triggering bet. With a choice of convenient banking options that make deposits and withdrawals easy for players all over the world, Lucky Club Casino offers dozens of unique online casino games from Nuworks.